The World Cup has kicked off and if we were in Brazil watching it live right now, then we would be meeting people from all over the world, each of them with their own unique identity, language, culture and food. The world becomes a much more beautiful place to live when we can all gather together, sit down and unite because of a common love. However, many times, instead of our similarities as human beings, we tend to focus on our differences and start harbouring feelings of superiority which can sometimes turn into racism without us even realising it. It maybe something as simple as saying “Nagas are superior to Indians” or vice versa. It’s time to look beyond a person’s genes, the colour of their skin or the slant of their eyes and instead see the brother, sister and friend that each one of us can be. Racism is the belief that all members of each race possess characteristics, abilities or qualities specific to that race, especially so as to distinguish it as inferior or superior to another race. It is also a belief that race accounts for differences in human character or ability and that a particular race is superior to another. Racism has existed throughout human history. In simple words, racism is the feeling of hatred towards one another on the basis of caste, creed, colour, religion, race, etc. India is one country where racism is widely prevalent. So far nobody dare voice out or is able to tackle racism. People stay in behind closed doors, though everyone knows that it should be wisely tackled or discussed. There comes a moment in our life when we feel it is time to awaken ourselves enough to struggle, enough of pessimism, of fighting and enough of crying. At this stage, we blink our tears and through a mantle of wet lashes we begin to look at the world through new eyes. We then awaken to the fact that it is time to stop hoping and wanting for something to change. India today needs change more than anything else, in several areas. She has to eradicate her narrow concepts and see things with broader minds and accept challenges with open arms. Racism is one of the burning issues in our country. As an Indian, it is our sole responsibility to take the initiative in tackling problems of racism that prevail around us. Racism is very common in our country. People discriminate one another on the basis of caste, creed or colour differences. We notice one caste or group possessing a sense of superiority over others. In many instances North East Indians are widely discriminated because they look different from the mainland Indians. . Differences in complex or appearance don’t necessarily mean that people should create a wide gap in between. Racism can be tackled in an efficient way by profound and deep understanding. 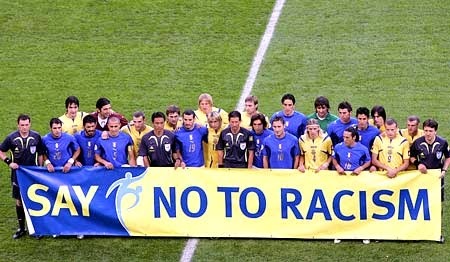 People need not stay aloof from this awareness but should come together and work hand in hand in eradicating racism. Awareness campaign or information through media must be carried out. People should renew their thoughts, ideologies and concepts regarding racism. The most important thing that people need to do is have a broad mind and develop their thoughts. Indians need not discriminate one another rather love one another and co-operate with each other. They need not discriminate but rather unite themselves and work together as one. The feeling of oneness should be encouraged and developed from deep within. Indians should accept the fact that people differ in race, culture, caste, creed, religion and customs. They need not pin point others or look down on each other. Instead of building a barrier between the other Indians and North East Indians, they need to break down the barrier and encourage equality. Once Indians overcome this racism, there can be tremendous changes in the country where people live harmoniously together as one. Indians need not disregard or disrespect the culture, tradition and custom of other regions in India. We consider our country as the largest democratic country. People have every right to enjoy democracy and liberty without hindering other’s freedom. In India, while the tri-colour Indian flag flutters atop the hills of the North-East, her Mongoloid inhabitants cannot conceptually connect to the notion of being ‘Indian’. The recent incident of young Nido Tania’s death in the national capital has witnessed mixed reactions s from people all around India-in a way that such activities are considered as anti-national activities. Now the question that arises is why can’t the people of North-East enjoy their own rights, which means – freedom to reside anywhere in the country, study in any institution, work in any company and pursue higher knowledge without any sort of discrimination? Infact, Indians should be happy to have different types of people with their unique heritage. We should stand together and stronger under the same umbrella so that we gain more knowledge from each other and develop positive aspects of life when under the same shade. It is now high time to wake up from our deep slumber and develop a positive outlook towards racism. Respect and regard should be given to each and every race regardless of their status, backwardness or difference. We live, at present, where there is an intense need for us Indians to enjoy the harmonious relationship with one another. Our future depends on how we prepare for it today and that is by learning lessons from past mistakes. Therefore, now is the right time to prepare a racism free India through mending and learning from the past failures and errors. Racism is ugly as it divides people from ‘us’ to ‘them’, but it can ultimately be put to an end by overcoming prejudices and discrimination towards each other. Universal brotherhood and a feeling of oneness should be planted in each and every individual’s heart so as to put an end to any sort of racist tendencies. Racism has never been a pleasant experience and we should put enough effort to eradicate it completely.